Not those sibeh KPCT obiang ones (real or otherwise) that you see them everywhere. It cringes me to tears to see a grown up man strutting it proudly. Birkies are fugly enough but this one is ultimate champion liao. Anyway, I got my crocs when my Timberland Decks finally decided to opened its mouth (both sides at the same time!) and transformed into a pair of walking buayas. I am partly to blame for I haven't worn them for like 8 years since they were left behind when I headed up to QQLand. So, not wanting to see a good pair of shoes go to waste, I headed to the DIY shop and gotten myself a tube of leather glue. It is a relatively simply repair process. 1) Empty the ENTIRE tube of glue onto the detached soles and smear it evenly. 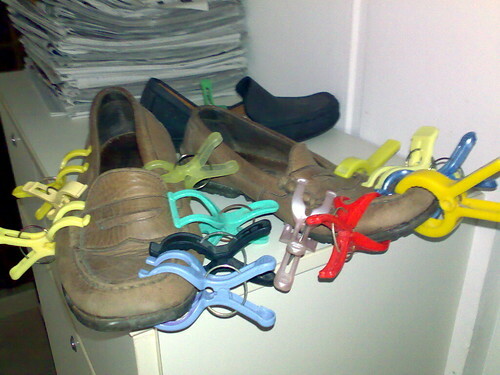 3) Thereafter, find all the clothes peg your can locate and kiap the shoes all over the place. 4) Upon hearing your mudder KPKB what happened to all the clothes pegs, act blur and quickly go downstairs to sio hoon kee. 5) Remove the clothes pegs after about 48 hours. thank god you didn't get crocs. they're the fugliest things ever! actually hor, you can just get gab and faith to sit on your shoes. heh. that will do the job too! What are wrong with Crocs??? I happen to like them. They are really comfy and slip proof. I wore them during my pregnancy.. I really like the bright colored ones..I still have a pair of leather lined Deck shoes from Crocs. The brighter the better!!!!! msvindicata: Cannot lah. Coz these things need to be held down for at least 48 hours in order for the glue to properly set in. sunflower & ahtiong73: I'd like to pride myself as some kind of a McGyver. Aloe: Cannot lah. Chair or phone book would spoil the shape of the shoe lor.